A record 22 players representing the Canadian Hockey League were selected in the first round of the 2013 NHL Draft at Prudential Center in Newark, N.J.
Of the 22 players, eight were from the Ontario Hockey League, including Sean Monahan of the Ottawa 67's by the Calgary Flames with the sixth pick. It wouldn't be too surprising to see a dramatic increase in first-round picks from the OHL this year when the draft takes place at Wells Fargo Center in Philadelphia on June 27. Over the next five weeks, Prospector Files will offer a First Team draft-eligible pick six at each position from the four major junior hockey leagues and one All European Team, beginning this week with the talent-laden OHL. The Quebec Major Junior Hockey League, United States Hockey League, Western Hockey League and international standouts will follow in the coming weeks. The OHL is stocked with high-caliber prospects across the draft board this season. In fact, 14 of the top 30 North American skaters on NHL Central Scouting's midterm list are from the OHL, and 20 of the 40 players invited to the BMO CHL/NHL Top Prospects Game in Calgary on Jan. 15 are also from the league. In 63 regular season games as a rookie in 2012-13, the 6-foot-1.5, 179-pound left wing ranked sixth on the Generals with 48 points, including 15 goals, and fifth in plus-minus at plus-19. It was a season in which the versatile left-handed shot earned valuable experience on a line with captain Boone Jenner (Columbus Blue Jackets) and Tyler Biggs (Toronto Maple Leafs). He's now fourth in the league with 89 points (36 goals and 53 assists) in 63 games. Dal Colle, who leads the team with 16 power-play goals, is No. 5 on NHL Central Scouting's midterm list of the top draft-eligible skaters in North America. 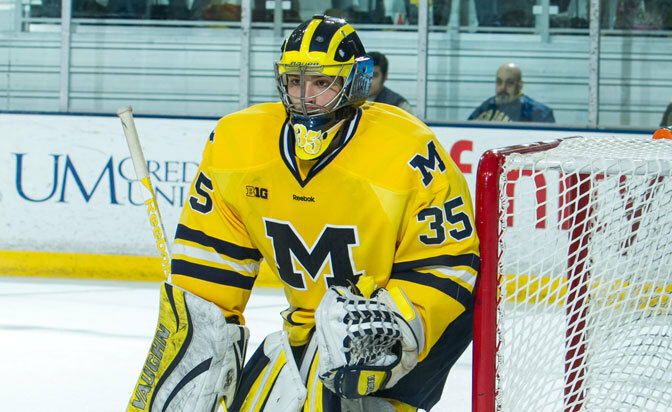 University of Michigan freshman goalie Zachary Nagelvoort bleeds blue and gold. The resident of Holland, Mich., not only attended many games at the university as a youngster but grew up listening to the Red Berenson Radio Show. Today, he's playing a big role in Berenson's lineup for the Wolverines. He's 10-7-3 with a 2.24 goals-against average and .927 save percentage in 21 games. The 6-foot-2, 190-pound left-handed catching Nagelvoort is No. 21 on NHL Central Scouting's midterm list of the top draft-eligible goalies in North America. He is also one of 19 goalie candidates in the running for the Let's Play Hockey/Herb Brooks Foundation Mike Richter Award. He and Boston College freshman Thatcher Demko, who is No. 1 on Central Scouting's midterm list, are the top two 2014 draft prospects among the nominees. "To be nominated for the Mike Richter award is a huge honor; I couldn't be any happier to hear that my name is put up there on a list with some of the best goalies in the country," Nagelvoort told NHL.com. "It's a great feeling to be able to contribute in the ways that I have right away my freshman year." Nagelvoort played much of the 2012-13 season in the North American Hockey League with the Soo Eagles and Aberdeen Wings before closing out the campaign with the Green Bay Gamblers of the United States Hockey League. His big moment for Michigan this season came Dec. 11 when he stopped 29 shots before earning a 2-1 seven-round shootout triumph against Ferris State University. "I would describe my game as aggressive and athletic," Nagelvoort said. "My athleticism allows me to make saves that a blocking-style goalie wouldn't be able to make. Also, getting out of my net and playing the puck is a big part of my game." NHL team: New Jersey Devils. "I was born in [Ridgewood] New Jersey." NHL player: Martin Brodeur. "He was the goalie I always looked up to." Most memorable moment: "I would say my first college shootout win over Ferris State." Video game: "I don't play video games. I've never been a big fan of them." Movie: "The Wolf of Wall Street"
Actress: "Anna Kendrick; hands down, absolutely beautiful." Website: "Twitter. My handle is @znagelvoort94." Music: Country. "I enjoy Billy Currington or Eric Church." Sport (other than hockey): "Fishing, golf or tennis." Breakfast food: "Big omelette with a little bit of everything in it." The 6-0.25, 178-pound left wing, No. 1 on Central Scouting's midterm list, is third in the league with 90 points on 36 goals and 54 assists in 55 games. He had a league-high 25-game point streak (17 goals, 46 points) snapped on Jan. 30 in a 4-0 loss to the Windsor Spitfires. Bennett was named the OHL player of the week on Monday after notching four goals and six points in three games. "Sam Bennett is a legitimate, high-end prospect and I would expect him to go top half of the first round pretty easily," Gregory said. "He grew during his underage year. He's one of those guys pushing the top half. He does everything well, has good size and skill." The 5-11.5, 178-pound left-hander, No. 14 on Central Scouting's midterm release, is considered a very creative player with a solid two-way game. He ranks first on the team with 86 points, is tied for first with 35 goals and is second with 51 assists in 62 games. "[Goldobin] has a high energy and is smooth out there," Central Scouting's Chris Edwards said. "He's got good playmaking ability and he probably would have a lot more points if players were able to finish for him. He doesn't always need the puck, but he sets up linemates, competes hard and is dangerous almost every shift. "He's the type of kid who receives a lot of ice time because he plays a complete game." At 6-4, 217, Ekblad captures the eye of any scout in attendance at any one of his games. He was the first defenseman and second player since John Tavares to be granted exceptional player status by Hockey Canada to be eligible for the 2011 OHL priority selection draft as a 15-year-old. That's a year younger than the standard age of 16. He's No. 3 on NHL Central Scouting's midterm list of the top draft-eligible skaters in North America, which also makes him the top defenseman on the board. Ekblad, who has 21 goals and 47 points in 52 games, played for Canada at the 2014 World Junior Championship in Ufa, Russia, in January, and impressed the coaching staff to the point that he earned top-four ice time at the tournament. He served as captain for Team Orr at the BMO CHL/NHL Top Prospects Game in January, and is also captain for Barrie this season. "It wouldn't surprise me one bit if Aaron went No. 1 overall at the draft," Edwards said. "If a team is looking for a defenseman and picking near the top, this is your guy. He's got the skill set and hockey sense needed to play at the next level." Compared by some to a young P.K. Subban of the Montreal Canadiens or Ryan Murphy of the Carolina Hurricanes, DeAngelo is having quite the season for the Sting. The 5-10.75, 175-pound right-handed shot leads all OHL defenseman with 53 assists and 68 points in 48 games. He is 13 points ahead of second place Matt Finn (Toronto Maple Leafs) of the Guelph Storm despite playing 13 fewer games. "He's a highly skilled player, and every shift he seems to make something happen," Edwards said. "He likes to jump up into the rush and can hit the one-timer. He skates well, has a quick recovery and very rarely comes off the ice. "He's not a physical presence and gets himself into trouble at times when he handles the puck too much, but that part of his game will come around." DeAngelo, a New Jersey native, was also one of the last players cut from the United States National Junior Team that competed at the 2014 WJC. "He has a high skill level, but has to learn to move the puck a little bit quicker," 2014 U.S. Junior Team coach Don Lucia said. "He's playing on a team [in Sarnia] where he probably has the puck a lot and has to make a lot of plays by himself. That's one of the things he'll learn and grow into as a player. I think he can take his game to another level." Despite the fact his team has struggled this season, Central Scouting's top goalie evaluator, Al Jensen, likes his drive and determination. The Parma, Ohio, native has actually gotten better as the season has progressed. In 56 games for Plymouth, Nedeljkovic is 23-25-7 with a 2.91 goals-against average, one shutout and .925 save percentage. He was invited to participate in the 2013 CCM/USA Hockey All-American Top Prospects Game in Pittsburgh in September and stopped 13 of 16 shots in 30:53 of playing time. "He's another very quick and athletic goalie," Jensen said. "He battles and has good strength in his crease area, has excellent recovery and lateral quickness. He's got quick reactions, flaring out his pads to make low corner stops. He's very smart and is capable of playing big games consistently." Freshmen Thatcher Demko and Zach Nagelvoort, two of the top goalie prospects eligible for the 2014 NHL Draft, were announced among the 19 candidates in the running for the inaugural Mike Richter Award honoring the most outstanding goaltender in NCAA men's hockey for 2013-14. The award will be presented at the 2014 NCAA Men's Frozen Four in Philadelphia. Candidates were determined by nominations from all 59 NCAA Division I men's hockey head coaches, and finalists and the winner will be selected by a committee of coaches, scouts and members of the media. Demko, a 6-3.75, 192-pound left-hander, is No. 1 on NHL Central Scouting's midterm list of the top draft-eligible goalies. He could become the first American-born goalie drafted in the first round since the Dallas Stars selected Jack Campbell with the 11th pick of the 2010 draft. Demko, who won the Eberly Award for sporting the highest save percentage (.966) at the Beanpot Tournament last month, is the youngest player participating in the NCAA ranks. The San Diego native is 13-2-3 with a 1.75 GAA, two shutouts and a .935 save percentage in 18 games. "He's a huge, strong goalie with excellent net coverage," Jensen said. "He has that NHL presence in the net. He's more of a positional style goalie that relies on his angles and size and he plays big in his stance." Demko was the second youngest (after 2015 draft-eligible center Jack Eichel) to play for the United States National Junior Team at the 2014 World Junior Championship. "When he drops in the butterfly, he gets his body in front of a lot of shots. He's smart at reading the play and gets set quickly," Jensen said. "Strength is definitely not an issue with him." Jensen acknowledged Nagelvoort has relied heavily on his positional play. It's worked out well too, as the 6-2, 190-pounder sports a 10-7-4 record with a 2.24 GAA, one shutout and a .927 save percentage in 21 games for the Wolverines. "He's got good size and has a good blocking style," Jensen said. "He has a very good extended butterfly and is tough to beat down low. Technically, he moves well, has strong legs and a good stance. He did allow a lot of big rebounds with his pads, but I still like his presence. He's also got a good glove hand." Born in Ridgewood, N.J., and now living in Holland, Mich., Nagelvoort is No. 21 on Central Scouting's midterm list of draft-eligible goaltenders. The Richter Award candidates combined for a 2.19 GAA, a .926 save percentage and a grade-point average of 3.12. Criteria for winning the award include skills on the ice and academic achievement and sportsmanship. For a complete list of nominees for the Let's Play Hockey/Herb Brooks Foundation Mike Richter Award, please visit LetsPlayHockey.com. 1. John Quenneville, Brandon Wheat Kings (WHL): The second cousin to Chicago Blackhawks coach Joel Quenneville was recently upgraded to an "A Watch" on NHL Central Scouting's February players to watch list. Also the nephew (through marriage) of Boston Bruins defenseman Johnny Boychuk, the 6-0.5, 182-pound left-handed center has 23 goals (seven power-play goals), 53 points and 51 penalty minutes in 55 games. "I liked [Quenneville] a lot when I saw him," Gregory said. "He has the pro makeup and is a hard-worker. He makes good plays very quickly and is good at moving the puck. I'd like to see more consistency from him, but I like the way he finds open spaces and his ability to make any kind of pass." 2. Dylan Sadowy, Saginaw Spirit (OHL): The left wing (5-11.75, 183) was upgraded to a "B Watch" on Central Scouting's February players to watch list. He has 26 goals, 35 points and a plus-13 rating in 63 games for the Spirit. A second-round pick (No. 37) by the organization at the 2012 OHL priority draft, Sadowy has 28 goals and 43 points in 124 career games. 3. Liam Pecararo, Waterloo Black Hawks (USHL): The 5-10.5, 164-pound right wing, committed to the University of Maine in 2014-15, has 16 goals, 45 points and a plus-17 rating for the Black Hawks (34-9-4). In 77 career games spanning two seasons, the Canton, Mass., native, added as a "C Watch" player on Central Scouting's February players to watch list, has 24 goals, 58 points and a plus-9 rating.